Can you teach a horse tricks without treats? I get asked a lot if it is possible to teach a horse tricks without treats. Yes is it possible, but I find it takes a lot longer to teach them a trick. Most horses would rather be out in their paddock with their mates eating grass. So you need to find something that makes your horse really WANT to work for you. A horse needs to be really motivated to learn new things and treats are a great way of doing this. However, once a horse learns a trick really well I will usually slowly reduce the times they get a treat. I may eventually only give them a food treat once every 5 to 10 times they perform the trick. Instead I will give them a scratch or rub as a reward. But I have found that by continuing to give them a food treat every now and again it keeps them super interested in their training. 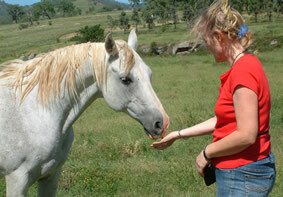 Their horse becomes pushy or nippy around treats. They don’t like having to carry treats around with them all the time. There are solutions to both these problems. To prevent your horse from becoming a treat hog you should never teach your horse a trick by just asking them to follow a treat. For example, I’ve seen lots of YouTube videos with horses ‘bowing’ by following a carrot between their front legs. The horse just becomes fixated on getting the treat and doesn’t ‘learn’ the trick. I also spend a bit of time teaching my horses food manners. This is super important even if you aren’t going to use treats to train your horse. You want your horse to be well behaved around food, no matter what the situation. There is a link to ‘Treat Training’ at the bottom of this post. To carry treats around I use an excellent little treat bag that clips around my waist. It has a spring that holds the bag open, so I can get to the treats easily or I can simply snap it shut to prevent the treats from falling out. I keep it near my boots and it is just a routine now to clip it on every time I go out to work with my horses. Thank you! Those tricks are perfect! And it’s great to know that if he is uncomfortable he’ll let me know. Thanks again ? Hi! I have a 14 year old gelding that I lease. We have a really strong and positive bond so he’s very trusting and willing. My trainer is his owner and she’s fine with teaching him good/useful tricks. I jump him and use standing wraps after courses. He’s pretty stiff and has needed to be adjusted by a chiropractor twice since April. He’s very eager to learn and is also a SUPER quick learner- he seems to really like the mental stimulation. He also loves treats. I’ve just started teaching him tricks and I’m starting basic liberty. He knows hug and smile. What other tricks should I teach him? I want to teach him how to bow but I don’t know if that’s good for him. I also want to teach him how to line up with the mounting block/other things that I can mount from because he doesn’t respect anything I mount from but one particular mounting block except I have no idea how to teach that. Do you have any tips? Thank you! Good to hear that you and your gelding have a good bond and he trusts you. And that he likes treats. You should be able to teach him just about anything 🙂 All you need to do is to ask him in a way that he understands. If he is stiff from work you might like to teach him some tricks that involve stretching. Check with your trainer / vet / or chiro to make sure that anything you want to ask him to do is okay for him. Also keep an eye on him and if he is reluctant to do anything then that usually means that it is too hard or it might be uncomfortable for him. He will tell you. Or you could teach him to stretch both legs forward and drop his head between his legs. That could be a good stretch for him. I really like to teach my horses to line up to a mounting block or fence. A very useful trick! I am working on teaching my ‘new’ horse Bella how to do this at the moment. I am filming her learning from the very beginning. She is working it out very quickly. As with all tricks you just break it into as many small parts as possible and teach your horse each part. Only move onto the next part when your horse really understands what you want. The important parts of this trick are that the horse must know how to stand still. They must also know how to follow you to a mounting block or fence and be happy with you being above them. And they must know how to step sideways toward you. Teach all these things… then join them together. I have a two and a half year old filly, who was feral off a 400 acre herd as of three months ago. With about 20 days on her she stands tied, steps up, backs, lunges left and right at all gaits, knows whoa, takes an English or western saddle, takes polo wraps… Basically there’s nothing she can’t learn. I want to start trick training but SHE HATES TREATS. Anything I offer to her she thinks is poison. If I leave treats in her grain she won’t even eat her grain. She will eat her omolene 300 out of my hand but that’s likely to be a big waste of grain..using it as treats for training. Any ideas? Wonderful that she can do all that in just 20 days. You two must have a very good relationship! A couple of suggestions: Take out some of her daily food to use for training. So she isn’t getting any extra, just getting it at a different time. Try lots of different treats and see if there is something that she likes. There are all the usual ones like carrots and apples but what about pears, bananas, grapes, celery or one of the pre-made horse treats you can buy like licorice. Find a spot that she loves being scratched. Use this as her ‘reward’. Bella, my horse LOVES a scratch on her belly or on her gaskins. Happy to help 🙂 It would be good to hear how your training progresses. I ride and take care of (not a lease, but rather a i-ride-my-bike-3-miles-through-below-zero-he=lays-down-with-me-in-the-paddock bond) a tall 16hh TB/STB gelding who is 18. He is stubborn and only trusts two people. he is a pig for food and despite that i cannot get him to bow! I used a hobble and he hated it so i never used it again. SOS! what can i do? It’s good that he is a pig for food. Those sorts of horses are usually SUPER keen to work out what you want so they can earn a treat. I like to break all tricks up into as many small parts as possible and teach each small part – only moving onto the next part when they understand completely. For Bow I teach my horses to 1. Lower their head. 2. Lift their legs by just pointing at them. 3. Leaning back. Then I just put it all together to form a bow. You will find that you don’t need ropes or hobbles (which can scare a lot of horses). Just one word of caution… if your horse is about 18 and has been worked hard then he may be a bit stiff or arthritic (like my wonderful old horse, Trigger). You might like to teach him a simpler form of the bow. Trigger likes to do the ‘Simple Bow’. I ask him to put his leg forward and drop his head. It looks nice and doesn’t put pressure on old legs and backs. If your horse is still flexible then just make sure that you ask him to Bow in an area that is very soft (sand arena is perfect). If you can’t find a soft spot then pop knee pads and cannon bandages on him. Hi i have a five year old mare that isnt broke or anything and she doesnt even know how to how to walk in a circle, she starts rearing and going crazy. What would you recomend for her? Before you start teaching your horse tricks they need to have done some basic ground work. Your horse should lead well and be calm around you. I would look for a good, kind trainer in your area that can work with you and your horse. It really helps to have someone there with you to give you ideas and support and to work out why your horse might be behaving like this. All the best. Jain & Trigger. That’s okay 🙂 I’ll email you the 2nd ebook again. Module One is free. 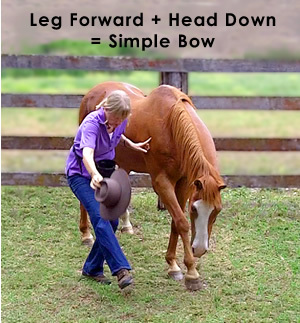 It covers some of the basics of teaching your horse tricks. If you like the training then you can register for all the other Modules (there is a fee to do this). All the details are inside the Horse Tricks Academy. Please let me know if you have problems registering and I can help you out with that. I never liked giving my horses treats, but guests always want to give tidbits so I taught all of them the way to get a treat is to back up. I want to teach other tricks too, but it is great that if I ask, “do you want a treat?” When they smell or see I have one, they automatically back away at least two steps & wait for treat to be given. Visitors think this is amazing and it was really very easy to teach and none of them are pushy. They know that pushy = no treat. It is really worth the time to teach even if you don’t want to do more. Elizabeth, what a great idea! It’s very important that when you start teaching your horse tricks with treats that you also teach them to behave around treats. There are lots of suggestions in our trick training ebooks on how to do this. The most important things are that you never give your horse a treat unless he does something you ask. It also REALLY helps to separate the treat from the trick by using a sound (I click my tongue). More on that in the ebooks as well. I use lots of treats when I first start teaching a trick but then cut them back once my horse has learnt that particular trick really well – only giving him a treat every now and again for doing that trick. At other times I give him a scratch on the withers or a rub as a reward. This keeps him interested in learning tricks but doesn’t make him a treat hog. It would be good if you could spend some time working on his ‘pushy’ issues. Have you got a good, kind, local trainer in your area that could spend some time with you both? Sometimes it only takes a few sessions and some training suggestions to help get you back on track. It will be hard to teach him tricks if he is always pushing you around. Once you get that sorted you should be able to teach him just about anything. I had a 16.2 ex-racehorse and he was VERY smart and LOVED trick training. I have a 13 year old standedbred that doesn’t know any tricks. so i want to start teaching him some tricks. what is the simple tricks i can teach a horse? Hi Jess, I hope you got my email. The suggestions in my email where….. I recommend teaching Mickey some very basic tricks that will help with teaching more complicated tricks. The most important one is ‘touch’. If you can teach Mickey to touch any item when you touch it or point at it, this will help with teaching him to ‘fetch’ and ‘kiss’ and several other tricks. I like to teach my horses to touch a soft ball, as this will lead to teaching them how to fetch. The ball needs to be soft enough so they can grab it in their mouth but not so small that they could swallow it. I use a small green ball that you will see in some of the pictures in the free ebooks. It is stuffed with soft material and is nice and soft for Trigger’s mouth. I got it for a few dollars from a reject / cheap store called Go-Lo here in Australia. Hi Donny, I’ve taught foals some simple tricks and they have really enjoyed it so I would start now with your colt. The earlier the better 🙂 If you can teach him some basic tricks it will make training him to do other things later on much easier. Just remember that the young ones have a very short attention span so don’t spend too long on any one trick – a maximum of 5 minutes per training session (But you can do several sessions in a day). Have fun! Jain & Trigger.